Ruffa Gutierrez changes her Facebook status from \"single\" to \"it\'s complicated\"
Ruffa Gutierrez changes her Facebook status from "single" to "it's complicated"
Actress Ruffa Gutierrez recently changed her status in her Facebook account from "single" to "it's complicated." This may shed light on the real score between herself and rumored partner John Lloyd Cruz. The two were seen spending time together in Los Angeles last week, although the actress denied that they are a couple. Despite Ruffa Gutierrez's repeated denial about being romantically involved with actor John Lloyd Cruz, a simple action in her Facebook account may shed light on the real score between the two—the actress recently changed her relationship status in the social networking site from "single" to "it's complicated." Rumors have been going around since last month that Ruffa and John Lloyd are romantically involved. Two paparazzi photos posted here in PEP (Philippine Entertainment Portal) last June 30 and July 2 show that the two celebrities spent time together in Los Angeles last week. 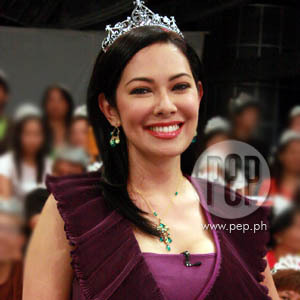 Last Sunday, July 5, on The Buzz, Ruffa confirmed that she met John Lloyd in the U.S., but only to help him go around the city. She denied that they're an item.